When do we need a HelpDesk solution? Processing time for petitions and comments is set by current laws and internal rules and regulations of each institution. To each helpdesk supervisor corresponds a department manager responsible for the final resolution of each recorded petition or comment. To each helpdesk technician corresponds an office worker that, under a supervisor’s leadership, carries out the activities for solving the petition. To each helpdesk client corresponds an individual or public institution that filed the petition or comment. Create categories for problems, petitions, or comments. For each category, define specific fields used to completely describe the items it contains. 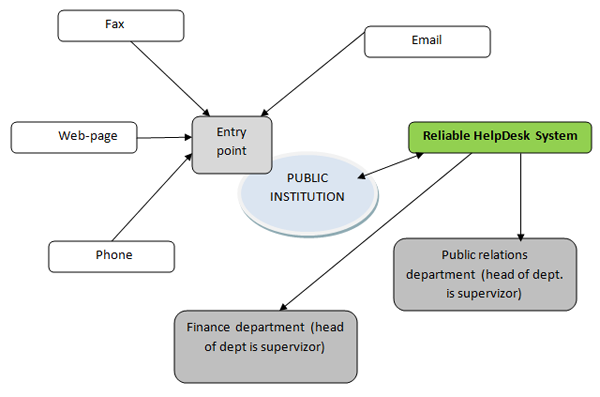 Additionally, create an automatic relationship between incident categories and technicians or supervisors that will solve the incident to allow an automatic and efficient work distribution among institution’s experts. Designate email addresses to incident categories. Configure and assign email addresses to helpdesk incident categories (e.g. payments@institution.com and complaints@institution.com correspond to Payments and Complains categories, respectively). This process results in automatically allocating incidents in indicated categories to technicians already assigned to handle the categories. Optionally, depending on technical specifications, it is possible to configure institution’s switchboard to redirect incoming fax messages to an email address and finally create an incident ticket. These tickets are automatically assigned to technicians/supervisors associated to each category. When configuring the switchboard, it is also possible to recognize the client’s caller id and create a ticket for this client. In this case, operators will enter the problem details into the ticket during the conversation with the client. Upon successful submition of an incident, the ticket receives a unique identifier, and all parties involved in it receive a confirmation email. Using the ticket’s identifier, the customer checks the ticket resolution process. Both internal customers (own employees), as well as external customers can benefit from this solution. Reliable Helpdesk allows us to automate tracking processes, reducing costs, and making things overall more easy. Moreover, the application ensures a history of...	Read more - Mr. Marc Mercado – General Manager – Softrend Ph. © Copyright MBM Software 2019. All Rights Reserved. Reliable HelpDesk  is a registered trademark of MBM Software.